Sinopoli's receptions total was a CFL single-season record for a Canuck and he's a finalist for the league's top Canadian honour for a second straight year. In the 2015 East final, it was Ellingson's late 93-yard TD grab that earned Ottawa a thrilling 35-28 home win over Hamilton. However, Ottawa isn't a pass-only offence as running back William Powell was the CFL's second-leading rusher with 1,362 yards and six TDs. The five-foot-nine, 207-pound Powell averaged a solid 5.43 yards per carry and added 39 catches for 219 yards and two touchdowns. 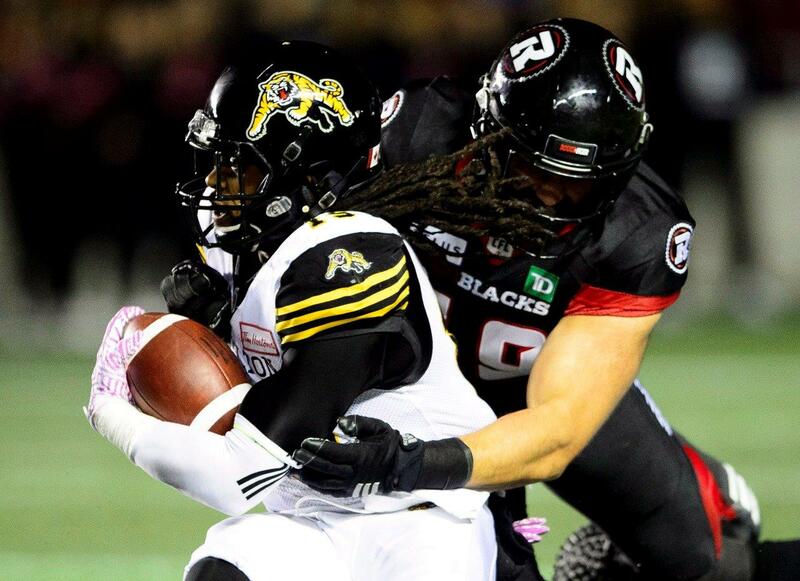 Hamilton heads to TD Place off a convincing 48-8 East Division semifinal win over B.C. Jeremiah Masoli, the East Division nominee for the CFL's top player award, threw for 259 yards and three TDs while averaging a season-best 13.6 yards per attempt. Masoli was the CFL's second-leading passer with 5,209 yards this season, his first full campaign as a starter. He completed 74-of-120 passes (58.3 per cent) for 937 yards with four TDs and four interceptions versus Ottawa. Luke Tasker had two of Masoli's three TD strikes against B.C. but it was youngster Bralon Addison who impressed, registering five catches for 124 yards. Hamilton's receiving corps has lost Shamawd Chambers, Chris Williams, Jalen Saunders and Terence Tolliver to injury this season. Forgive the Winnipeg Blue Bombers if they'd rather forget about the last time they faced Bo Levi Mitchell at McMahon Stadium. Kamar Jorden played a big role in Calgary's home victory over Winnipeg. He had 10 catches for a club-record 249 yards and a TD before suffering a season-ending knee injury later in the year. Then again, former Bomber Chris Matthews had five catches for 113 yards in last month's loss to Winnipeg. Over the two games, Mitchell has completed 47-of-77 passes for 726 yards with four TDs and no interceptions as Calgary chases a third straight Grey Cup appearance and its first championship since 2014. Winnipeg comes in off its 23-18 road win over Saskatchewan in the West Division semifinal, its first playoff victory since beating Hamilton in 2011 East Division final. The Bombers, who haven't won a CFL title since 1990, went on to lose 34-23 in the Grey Cup to the Lions at B.C. Place Stadium. A big key to the Bombers ending their title drought could be running back Andrew Harris. For the second straight year the Winnipeg native was the CFL's rushing leader (1,390 yards) and was named a finalist for the league's top Canadian award (he won it in 2017). Harris ran for 123 second-half yards against Saskatchewan and is more than capable of carrying the Bombers' offence by himself. However, Harris does get a lot of help from Winnipeg's solid offensive line. Although Winnipeg's passing attack ranked sixth overall (244.9 yards per game), the Bombers led the CFL in offensive points per game (28.2) and offensive TDs (53) and were tied for third in fewest sacks allowed (36). Winnipeg's defence finished tied with Calgary for most forced turnovers (49) and second to the Stampeders in fewest offensive points allowed (20.8), offensive touchdowns (35) and passing touchdowns (15). 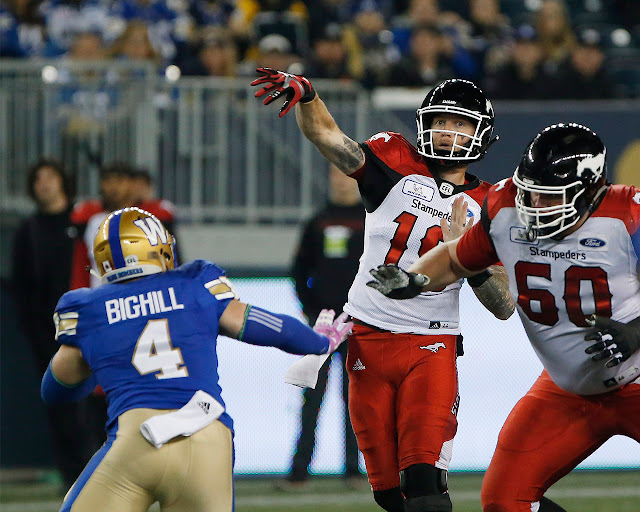 Linebacker Adam Bighill anchors the unit and will play Sunday despite suffering an undisclosed injury against Saskatchewan. Calgary boasts a 34-20 (.630) home playoff record and was 7-2 this season at McMahon. The Stampeders' last home playoff loss was in 2013 to Saskatchewan.